A practical example of lightpacking nordic style with kids is the trip I made with my son Jakob a couple of years ago. He was 13 years old at the time and wanted to ascend Kebnekaise, the highest Swedish mountain. This article tells the story of how we planned and geared up for this trip. The previous article has more on hiking with kids in general. (This article has, more or less, been published in Swedish before). Having been on the peak before, in winter and with everyhing covered in clouds, I could advice that if Jakob wanted to be sure to actually see something from the top, we needed some leeway. If the weather was bad it was essential that we had time to wait. We landed on planning for a weeks hike, which in practice meant 5-6 days of hiking and the rest travel to and from the mountain. 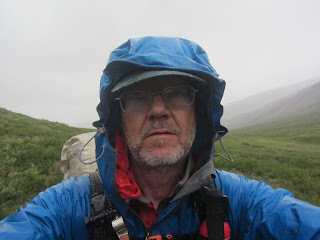 The idea was to go from the trailhead in Nikkaluokta to the foot of Kebnekaise in one day, and then make an ascent along the Western route the next day. If this did not work we would stay in the neighborhood and always have the Durling route or the Western route within reach if the weather looked promising. Our homemade tarptent with their two individual bug/innertents. Note that the whole front can be closed with the flap and zippers. The basis for all lighpackingt is to reduce the weight of the big three; wear, shelter, sleep. So during the winter I made an ultralight backpack of some smaller caliber than my own homemade of 600 grams of Jacob. The weight of his pack landed at 225 grams, plus a waist belt /waist bag of 135 grams. This serves takes the load of the shoulders since you sort of have the pack 'standing' on the fanny pack. The pack and belt holds about about 50 liters. A light and warm sleeping bag was purchased. We planned that I myself and other family members also could use the same bag in other contexts. For summer hiking in our nordic the mountains, I want a sleeping bag that can handle approximately zero degrees.The choice fell on a Marmot Hydrogen L which weighed 685 grams. Expensive, but has seen much use since then. I myself would use my homemade down quilt that weighed 600 grams. As a sleeping pad and also serving as a back plate for the backpacks, we chose two Thermarest Short weighing 525-600 grams depending on thickness. I did of course hog the thickest for my weary old bones. We also carried two very light and cheap Jysk closed cell pads weighing around 150 grams each. These were used for breaks on rough terrain and to insulate our legs and feet while sleeping, since the Thermrests were only 1200 mm long. A great setup that I still use, with a Neoair these days. The third heavy part of the gear was the home-sewn tarptent at 525 grams. To this was added our individual mosquito tents that did weigh 200 grams each. This is probably a shelter that is a little too austere for most families with children. Now, Jakob was a hardy kid and with his 13 years he was no toddler, but my opinion is that with children you should invest in a somewhat heavier sturdier shelter than a lightpacker might ordinary choose. But it was cheap and did not weigh more than some 900 grams in all, which was pretty light for a two man shelter 2006. Having a space that makes you feel protected all around and where you can cuddle up and read when the weather is bad, is worth carrying. With kids you will likely spend more time in your shelter than with adults or on your own. So some extra margins for shelter are recommended for trips with kids. The tarptent with lines around ready to pack. About the size of a loaf of bread. My initial idea was that Jakob should carry his own personal equipment, I would carry mine plus everything else such as tents, cooking gear and safety equipment. This meant that in Jacob's backpack in addition to sleeping pad and sleeping bag you also found his raingear. This was a ligth and inexpensive Packaway set from ITAB costing approximately SEK 600 and weighing some 500 grams for jacket and pants. This rain suit was also the right size for my wife which made it an investment not only for this trip. Since I like hiking with an umbrella Jakob was also furnished with one. There was also a fleece jacket, down vest, fleece hat, gloves, pile socks for camp and sleep, and a pair of waterproof socks from Sealskinz to use in cold and wet weather. A cup, spoon and an eating bowl Pack base weight, that is what Jakob carried all the time was 4.5-5 kilos. We both wore thin, short sleeved synthetic shirts of no particular brand and bought really cheap. This was keeping in style with our thin synthetic trousers and so called water sport shoes with mesh uppers. We both used walking poles and mine were also used as tent poles. Wearing mesh shoes and thin socks in snow coming down from the Pyramid Pass is not as cold as you might think. All that now was needed was food. My first thought was that Jakob could carry his own food. This would have added another 4-5 kilos to his load and would not have been impossible for him. But a better and more elegant solution, in my mind, was that we divided the food between us so that the total pack weight was the same percentage of our respectiv body weights. Is lightpacking for the whole family not terribly expensive, one might ask. Well, and maybe...not. As we have calculated here on Fjaderlatt.se several years ago, light gear is approximately 1 SEK cheaper per gram than traditional gear. Meaning that a 2000 gram pack costs about 1000 SEK more than a 1000 gram pack. The waist belt for Jakobs pack. The pack 'stands' on the fanny pack and some padding has been added as well as a silnylon pouch for map and compass. Trousers of thin synthetics were already part of Jakobs wardrobe, shirt and baseball cap as well. A cheap windshirt was bought at a clearance in a sporting goods store for 200 SEK (€20). It also fits mom who is still using it when biking or riding. The water sport mesh shoes were used as sneaker to school every day until winter after the trip, so no extra cost really. Thin nylon socks are not expensive and the fairly light rain jacket and pants have already been mentioned. Same brand that Gustav from The Bearable Lightness used on the infamously wet Vålådalen trek this year. The sleeping pad bought at Jysk was 39 SEK, cup and spoon was even less and the bowl was free with a frozen microwave soup. He already had a fleece sweater, borrowed moms down vest (very good combination for kids since the vest fits a wide range of ages) and used his own fleece cap and gloves. The pack was homemade and has also been used by me on several trips, but at least here in Sweded most kids have backpacks to school and that can be used. By far the most expensive piece of equipment was of course the top-of-the line sleeping bag that set me back 2500 SEK (even if it was on sale from a British internet vendor). But he and other family members can use this bag for at least 10-15 years and it will be reasonably light during all that time. I use it regularly on summer hikes myself. Still, this investment is the heaviest for a family with kids. So you might be forced to pick something heavier and more expensive. But the Kelty Cosmic Down 20 sounds an amazing bargain at $99.95 and 1,1 kilo. If you have several children you might have to compromise here, but if you have been really restrictive and kept the weight down on the rest of the gear you can bring a sleeping bag that is on the heavy side. Tents have already been mentioned and I imagine few will sew a tent like I did. But in my opinion a weight conscious tent for kids is not much different from one for adults. You might already have one or you might be considering investing. Keep in mind if you plan for a trip for several children and adults that everyone does not have to fit into one tent. A slightly larger tent with a foretent might be used for the family get together and then two persons can sleep in a smaller shelter beside the larger one. Depending on the age of the kids they might want one parent in each tent or they might want to sleep on their own. To sum it up; lightpacking with kids need not be as costly as you might think. You have to look at what you need and what you already have and make your own cost/benefit analysis. And remember that high quality gear is not that difficult either to buy or sell second had on the Internet. So what of the hike? Since Kebnekaise is a fairly well-trafficked area, and there are cabins with 10-20 kilometer intervals, it felt quite safe to make the trip that we did. We were never far from a roof over our head should the tarptent fail, for instance. In theory, everthing was OK. In practice it also turned out really well. On our first day we passed the mountain lodge at Kebnekaise at dusk, having walked some 15 kilometers and travelled some by boat from Nikkaluokta. A really cold and biting wind made us almost jogg the last kilometers to camp, in order to keep warm. I think Jakob was a bit worried; a tiring day and a razor wind cutting through the wind shirt when darkness was falling. But I found a perfect hollow for the tent and we slept like logs. When morning came we were perfectly positioned for long days hike to the top. And morning came with blue skies an sunshine. Perfect. We set of up the mountain and reached the top after some 4-5 hours. The night before we had been advised by some passers by to "use better shoes", but our runners brought us up the scree slopes, across the snow fields and all the way up. The rest if our alloted time was spent leisurely exploring the area. We walked some distance on Kungsleden (The Kings Trail/Royal Trail) until the mosquitous got the better of Jakob's temper and I led us to some of the spots in Kebnekaise that are closest to the heavens; like the Unna Räitavagge valley. 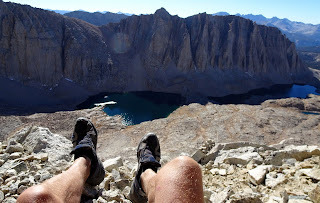 There is no doubt that the low weight of our packs ensured that Jakob had a great hike and could enjoy some really strenous passages well away from the trails and the more frequented parts of this alpine area. Not to mention how nice it was for dad not to have to lug a 25 kilo pack across the Pyramid Pass.